Since Internet Explorer 7 (IE7), IE has built-in instant search box on the top right corner of IE window, providing an easy way to initiate web search. The search done by the IE instant search is actually depending on which Search Provider you choose. You can add in as many Search Providers as you want, such as Google, AOL, Ask.com, Yahoo!, Windows Live Search (included by default), Amazon, ESPN, MTV, Expedia, Wikipedia, Amazon and etc. However, if you format your computer, or change your computer, the IE Search Providers list will be lost. To keep it, there is a hack and trick to export and save the Search Providers list, which can then be copied, transferred or migrated to new computer or re-imported after re-installation of Windows operating system. On source computer with the IE Search Providers list you want to save, open Registry Editor (Click on Start button -> Run and key in regedit). 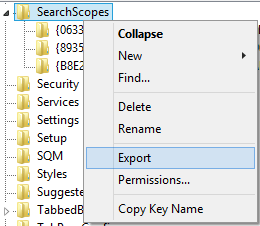 Right click on SearchScopes and choose Export on the pop-up right click context menu. In the Export Registry File dialog window, save the file with a name with .reg extension. Copy and move the .reg file that been created to another computer, or to a backup location such as USB flash drive in case you want to format the computer. On the destination computer that you want to import the Search Providers list, double click on the .reg file to import the registry value which contains all the Search Providers for IE from source computer. Note that your existing Search Providers list on destination computer may be overwritten. The trick works on all versions of Internet Explorer with search providers support, including IE7, IE8, IE9, IE10, and IE11.